Let’s face it, when you’re racing out the door to get to work, eating a healthy breakfast isn’t a priority. You scarf down whatever is in sight, or hit a Fast Food drive-thru for a fat-filled bacon biscuit. Breakfast is an important meal because your body hasn’t had any nutrients since dinner the night before. 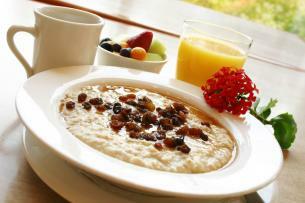 Skipping breakfast is not a good idea, especially for those trying to lose weight. 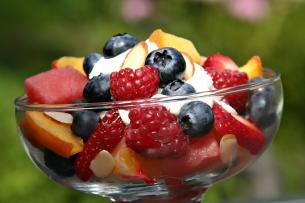 Tropical Fruit Yogurt Parfait: “Parfait” is just a fancy word for a combination of yogurt and fruit. Fruit Salad: It doesn’t get simpler than this. Just grab a container, a variety of fruit, and spend 5 minutes chopping. Finally, sprinkle granola on top and catch the next bus. I like to add a few pieces of cheese, too. You can save time by doing it the night before if you use fruit that holds up well after being chopped. Microwave Scrambled Eggs: If you don’t have time to make Kathy’s stove-top scrambled eggs, then just nuke them! Crack open two eggs and whisk well in a microwave-safe dish. Put in a pinch of salt and pepper and set your microwave for 1 minute. Check to make sure your eggs are not runny by sticking a fork in and fluffing them up. You can put them on toast or on an English muffin and wrap it all up in aluminum foil and go. You can also hard-boil eggs the night before and take these with you. French Toast Sandwich: Toast can be made in endless ways that work for folks on the go. But French Toast is my favorite. Grab two slices of frozen French toast — or use Kathy’s recipe — and stick them in the toaster to heat up, then pop whatever you want in between. You can keep it simple with a couple of slices of cheese, or even add a slice of ham. I’ve even done a smear of peanut butter and some banana slices. Some cream cheese and a few blueberries work just fine, too. Smoothie: We’ve already given you many smoothie ideas, and most can be made the night before. So all you have to do in the morning is grab your thermal mug and get into the car. Have a breakfast bar on the side, and you’re guaranteed to make it to lunch without a hitch. Oatmeal: Yeah, yeah, you expected to see this one on the list. I dislike plain old oatmeal straight out of the box or packet. But if you take a few minutes, you can turn ho-hum oatmeal into something fun and flavorful. If you don’t have any fresh fruit, try combining your oatmeal with dried fruit, Cheerios, chocolate or even peanut butter. Apple and Pear Crisp: This is another nuked delight that tastes like dessert at breakfast. Who wouldn’t like that? Pop it in a microwaveable container so you can cook it at work. Grilled Cheese: Kathy’s recipe is super easy, or you can pop bread in the toaster oven and let the cheese melt right there. Just keep your eye on it because it cooks quickly. The good news is that you can skip the butter if you’re watching calories. Wrap it and run! I love this website! The instructions are clear and well-formatted. A good thing for a cooking beginner like me! Thank you so much! Kasey, startcooking.com is all about learning the basics in cooking. I wish you the best of luck developing your skills! I love this website! The instructions are clear and well-formatted. simply awesome site. Cooking is easy as long as you start with the basics! This website is really helpful, specially the video clips for each recipe so I can follow clearly. Thank you for the food instruction.